Drive As Though Your Life Depended On It! Put the Brakes on Fatalities is a national program whose goal is to deliver to the public the major causes of transportation fatalities and their avoidance. 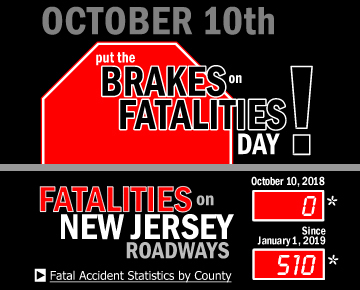 Each year on October 10th, every driver, pedestrian, motorcyclist and bicyclist is encouraged to be exceptionally careful so that for at least one day, there will be no fatalities on New Jersey's roads. In 2016, 603 individuals lost their lives in motor vehicle related crashes on New Jersey roadways. Of particular concern were the 166 pedestrian fatalities, which represents over 27% of all motor vehicle fatalities. When compared to the national average of 15%, New Jersey is clearly overrepresented and must continue to take action. Each year during the seven days ending on October 10th, the New Jersey Division of Highway Traffic Safety partners with the New Jersey State Association of Chiefs of Police and other law enforcement agencies statewide to help raise awareness throughout New Jersey. Additionally, all of the state’s roadway users are asked to do their share (slow down, avoid distractions, stop for pedestrians, use crosswalks and obey crossing signals). Put It Down! Just Drive.